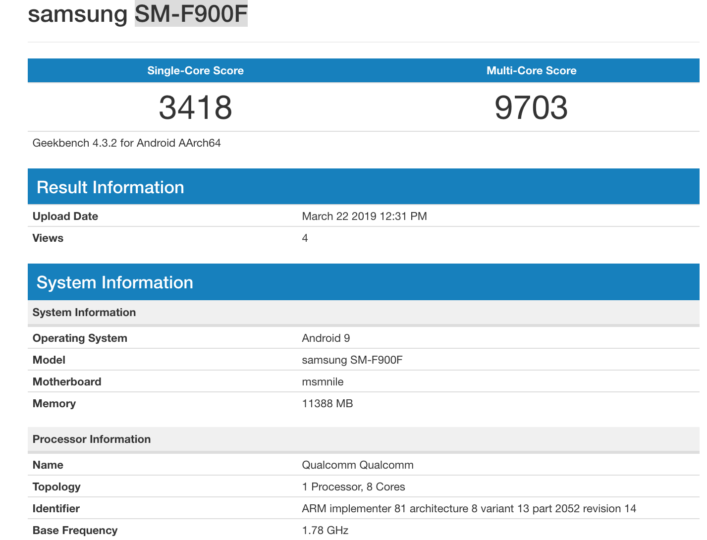 With less than a month to go until its release, the first Galaxy Fold benchmark has now surfaced on Geekbench. It’s for the global or “international” variant of the device with model number SM-F900F. The variants which have the letter “F” at the end are classified as such. Just a cursory glance at the results reveal that the global variant of the Galaxy Fold will ship with a Qualcomm processor. That was to be expected since Samsung has previously said that its foldable smartphone will have a 7nm 64-bit processor. That shuts the door on its latest Exynos 9820 chip because it’s 8nm. This is a notable development because Samsung always ships Exynos processors with the global variant of its smartphones. The Qualcomm processors are limited to a couple of markets like China and the United States. It’s making an exception for the foldable smartphone, though. The Galaxy Fold has posted a single-core and multi-core core of 3418 and 9703. We’ve mentioned before that benchmark results are not indicative of the true performance of a handset. That holds true for this device as well. It’s also unclear whether this particular device is a development prototype or a consumer version and if it’s running stable firmware. There’s 12GB of RAM onboard, as expected, Samsung confirmed that during the Galaxy Fold’s unveiling. The Qualcomm chip in question which fits the 7nm criteria is the company’s latest Snapdragon 855. It has an embedded X24 LTE modem and as we exclusively reported, the Galaxy Fold will be available in both LTE and 5G variants. We can expect to see more benchmark sightings going forward as the release date comes near. Samsung announced on February 20 that the Galaxy Fold will be released on April 26. The handset will initially go on sale in South Korea and the United States. Samsung has said that it will offer the Galaxy Fold in major markets across the globe. Please create list of this markets. What exactly “F” mean ? So Exynos is worse than Qualcomm ? Does it have an Optical or Ultrasonic FPS?.. Apparently, its side mounted? 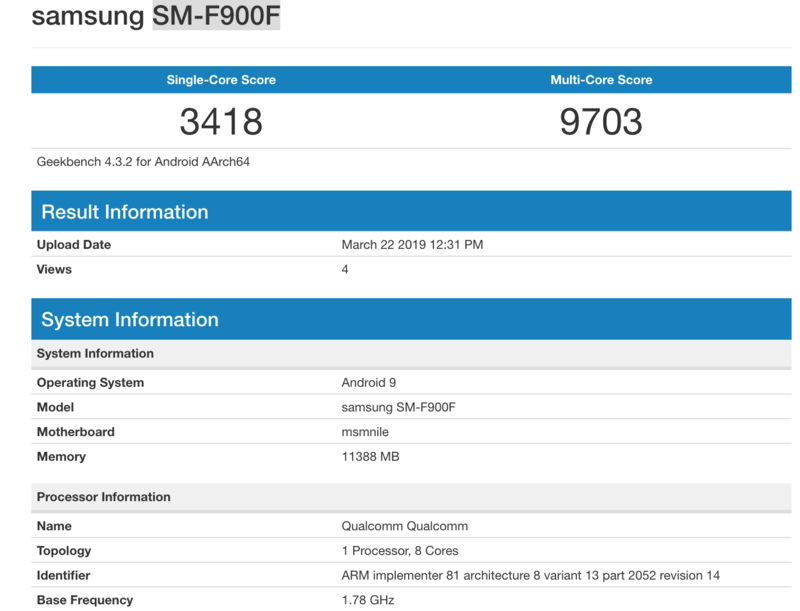 This is samsung admitting that the snapdragon 855 is superior to their own exynos 9820. It really is. Samsung has been slacking since the S9 with the Exynos chips. I don’t know what happened. It’s true, I am with exynos note 9 and it’s not the best experience you can get tbh… I know few people that got both note 9 variants, all of them are experienced and all of them was prepared for a difference… and again all of them said that they didn’t expect it to be that big and returned the exynos variant, keeping the snapdragon even if’s not good for rooting/custom ROMs. I’m really disappointed with the battery life of my S10+ compared the snapdragon verient makes want to return it.